Despite the railroad stocks delivering exceptional shareholder returns over the last few decades it’s interesting how little is written about them on financial media sites. 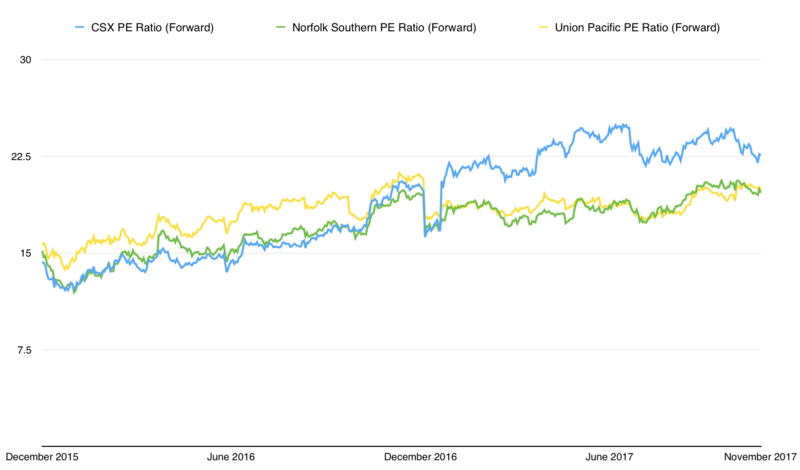 The most well known – Union Pacific Corporation (NYSE: UNP) – only has around a dozen articles on Seeking Alpha dated from the second half of the year. It makes sense I guess, I mean it isn’t really a consumer facing kind of industry. Nor does it inspire the same amount of hype as, say, technology stocks do. It just seems to be one of those industries that a lot of folks don’t ever take a second look at. That said I really like these stocks for a number of reasons. First of all they basically form a natural oligopoly. Back in 1980 there were around 40 Class 1 railroads in operation in the United States. Today, after a long series of mergers, bankruptcies, reorganizations and so on, that figure is down to just seven. For the purposes of this piece I will concentrate on the three largest US-based railroads: Union Pacific, which I have covered briefly before; CSX Corporation (NYSE: CSX); and Norfolk Southern (NYSE: NSC). The latter two operate in the Eastern United States, while Union Pacific covers the area west of a hypothetical line running down from Milwaukee through Chicago, Memphis and New Orleans near the Gulf of Mexico. Between them we are talking about somewhere in the region of 70,000 miles worth of track. I mean imagine the obstacles to overcome in trying to replicate the sheer scale of that network. Not just the regulatory requirements in laying thousands of miles of steel track across a continent, but also the cost of doing so. The second reason to like the railroads is that they act as a kind of toll booth on the economy. Think of the goods that require long-haul transportation by rail: things like automobiles, chemicals, natural resources, and so on. They are the kind of essential ingredients of modern day trade that aren’t going away anytime soon. As long as the United States remains in business then so do the railroads, even if the nature and precise mix of goods hauled over them is prone to change. This brings us onto the third and final point: these railroad companies are now more profitable than ever. Part of the reason for that lies in the oligopoly point above since many of the long-haul routes that we’re talking about also represent the most viable, cost-effective option for transportation. Hauling by truck or airplane isn’t worth it for various reasons (e.g. hauling by rail is something like 3x more fuel efficient than trucking), and a water route is a no-go for obvious reasons. In addition there have been a plethora of operating efficiency gains made over the years. By that I mean things like the effect that automation has had on operating a railroad (e.g. reduced labor costs by automating certain manual jobs), and the general switch to computer/digital technology (e.g. better route planning, reducing bottle necks and so on). In terms of intermodal freight the latter point has been particularly important in competing with trucking’s two previous competitive advantages: reliability and speed. In any case you can see the results when you look at the railroads’ financials. Over the five year period between 2011 and 2016 our big three posted average net profit margins of 18% and their combined return on capital is in the double digit territory (usually a good sign of a top business). 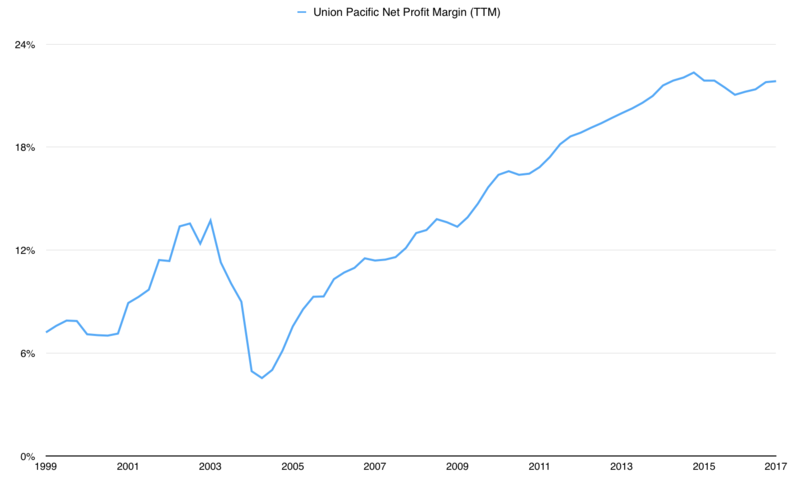 Best in class winner Union Pacific is posting free cash cash flow margins and returns on capital that are north of 15%; an astonishing set of figures for what is supposed to be a capital intensive underlying business. Pretty much the only reason not to like these stocks right now is their valuations. Check out how the forward price-to-earnings ratio of those three has moved over the past couple years. Now on the plus side that’s been a great tailwind for any current stockholders. When you’re going from the 15x annual profit area to the 20x area you’re looking at an extra 33% to the stock price assuming all other factors being equal. It goes without saying but if that happens in the space of a two year period it’s going to represent a very nice boost to a stock portfolio. I’m making this point a lot recently but the downside risk for prospective shareholders, or even current ones who are reinvesting dividends or dollar cost averaging, is that this effect will go into reverse at some point in the future. For example Norfolk Southern stock is currently trading at around $127.50. This year it is on course to make around $6.45 per share in net profit, giving us a current price-to-earnings ratio of around 20. I looked up Norfolk’s long-run average valuation and it lies somewhere in the region of 14-15x annual earnings. In other words if the market decided to cut Norfolk’s valuation to its historical mean overnight then you’d be looking at a share price hit of 25%. Again I’ve raised this point so many times on articles that I think I can jump straight to the conclusion here: the shorter your outlook the more dominant valuation swings tend to be. Conversely the longer you are willing to hold the less important it becomes because the shareholder returns equation gets dominated by the other two long-term factors, namely earnings growth and cash dividends. If your outlook is anything other than long term then don’t buy the railroads right now. But as part of some dollar cost strategy or long-term buy-and-hold I probably wouldn’t let it bother me. As I commented at the end of that Union Pacific article a recession would probably be a great time to load up on these for the long haul.